Purchase price link includes shipping to US addresses. To purchase pendant only, click purple price link above for secure online checkout paying by credit card or PayPal. contact me for assistance with chain purchase or to arrange multiple purchases from website. This cross was originally made in 14K gold for The Rt. Rev. Miguel Tamayo. Bishop Tamayo was consecrated and installed as diocesan bishop in the Cathedral of the Holy Trinity, Montevideo, on the feast of St. Augustine of Canterbury, 26 May 1998. 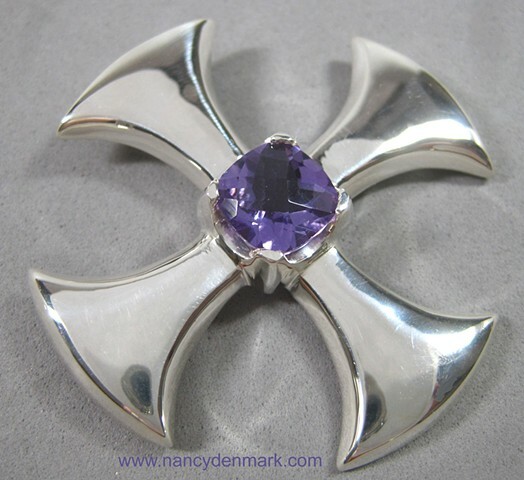 Bishop Alard also wore this Canterbury version in silver with an amethyst as a daily cross in the office.